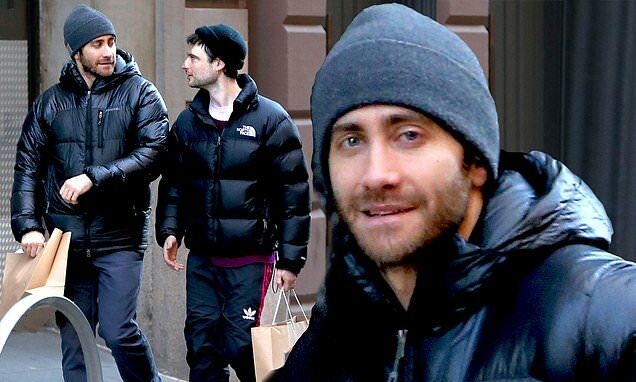 Longtime friends Jake Gyllenhaal and Tom Sturridge found some down time to take in a bit of shopping on Sunday. The acting mates have been seen out in the streets of New York City dressed for comfort and the chilly northeast weather. The actors co-star in the off-Broadway show Sea Wall/A Life. Gyllenhaal plays in A Life and Sturridge performs in Sea Wall in the show that has two parts. Gyllenhaal wore a puffy black jacket with gray pants, gray wool hat and white sneakers. English-born Sturridge wore a puffy black North Face jacket with black Adidas sweat pants and black sneakers. The 33-year-old actor finished the look with a burgundy sweater over a white T-shirt and a black wool cap.